Between 19 and 26 October 2017, Romania reported two cases, Italy reported one case and Serbia reported one case. France reported one case in a newly affected area. All other cases were notified in areas already considered to be affected. Serbia reported one death due to West Nile fever and Romania reported three deaths. 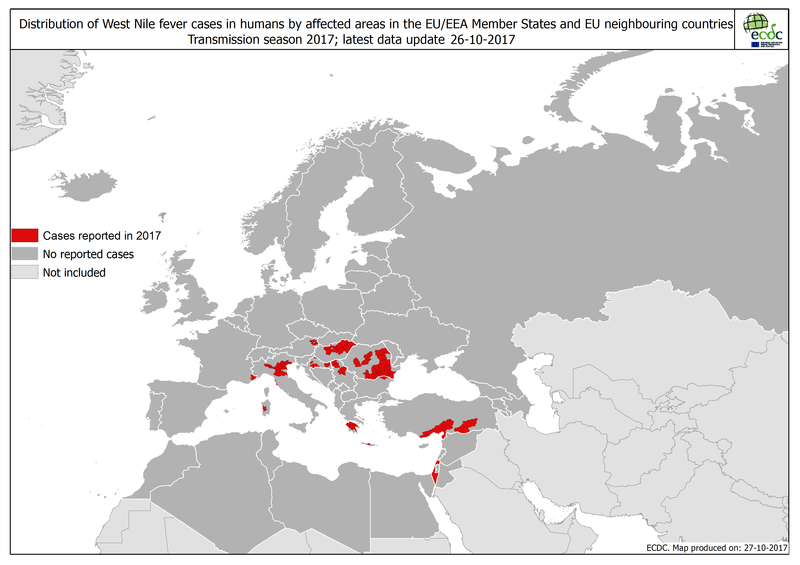 In addition, ten equine West Nile fever cases were reported through the Animal Disease Notification System (ADNS) of the European Commission. Italy reported five cases, Spain reported four and Greece reported one. Since the beginning of the 2017 transmission season and as of 26 October 2017, the EU Member States reported 197 cases: Romania (64 cases), Italy (55), Greece (48), Hungary (19), Croatia (5), Austria (4), France (1) and Bulgaria (1). Seventy-one cases were reported in neighbouring countries: Serbia (49), Turkey (5) and Israel (17). Twenty-four deaths due to West Nile fever have been reported since the start of the transmission season: Romania (13 deaths), Greece (5), Hungary (1), Italy (1), Croatia (1), Serbia (2) and Turkey (1).